Nearly 140 people came to the Institute of Contemporary Art to be sworn in as American citizens earlier this month. I passed them as I went to see “Nari Ward: Sun Splashed,” a wickedly pertinent exhibition by a Jamaican artist who became a US citizen in 2011. The soon-to-be Americans and their families looked eager and proud. I felt excited for them — it was like glimpsing a couple on their wedding day. But then I worried. What does it mean to become an American now, as the White House seems to be snatching the welcome mat from the front porch? On the bright side, these new citizens won’t have to fear deportation, as some immigrants do. They may suffer America’s bluster, small-mindedness, and divisiveness, but they will also partake in its extraordinary freedoms and privileges. Ward’s show, at once mystical and deeply rooted, meets us where we are: in a country grappling with fear, decay, and prejudice, yet buoyed by tenderness and hope. The artist came up in the 1990s, in the glory days of identity art. His big assemblages embrace his heritage, but he tethers them to communities where he works, and the stuff of those places. He’s a trash picker and a sidewalk scavenger. Stories and auras float around the things people leave behind, and those spirits animate Ward’s art. 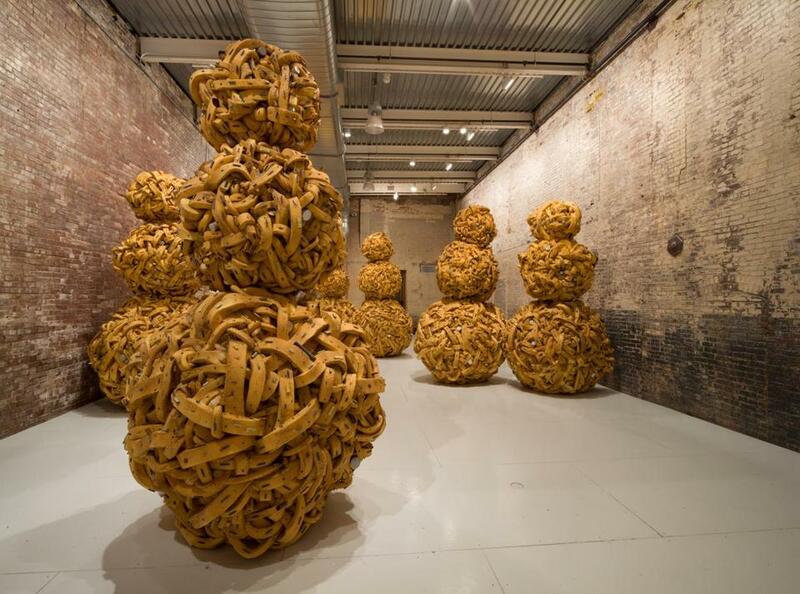 His labor-intensive process, bundling, wrapping, and knotting, makes them weighty and tangible. The practice recalls the crafting of minkisi, Congolese power figures used for healing and protection, and echoes folk art from the American South. The works, with their grab bag of materials, function in the way of collages: Meaning pours into the crevices, where there’s room for dreams and contradictions. Good. Because the themes Ward’s work summons — what it is to be an American, to be black, to be an immigrant — are likewise full of dreams and contradictions. For “Homeland Sweet Homeland,” he stitched the Miranda warning in gold into a big heraldic pillow and adorned the text with images of razor wire, an eagle, and slotted spoons. It pays tribute to a country where such rights exist, and eviscerates a society in which black men had best memorize them. 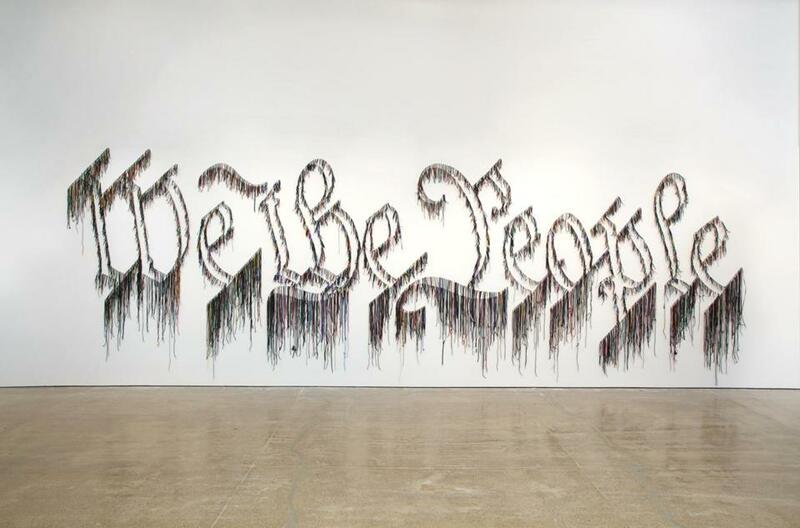 In the wall piece “We the People,” the ornately scripted opening lines to the Constitution are made of humble shoelaces. Such trenchant pieces, necessary critiques of US society, are nuanced, but not the best art here. The best works are dumpster dives seeking redemption. “Savior,” a towering form springing from a shopping cart, features an oddball assortment of bottles, fencing, clocks, and more, topped off by a chair, all wrapped in a tight plastic weave of red and blue. It’s the homeless man’s cart filled with everything he owns. Yet “Savior” is a catapult: All that stuff off the street hurls that seat toward heaven, or at least tries. 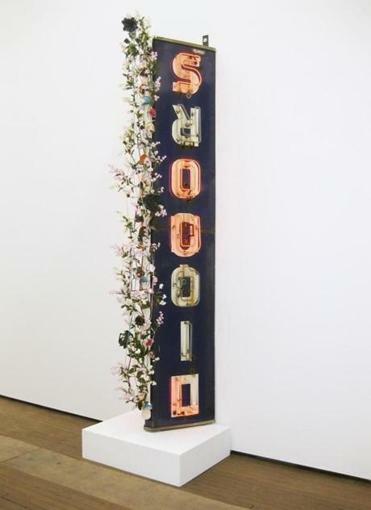 In “Radha LiquorsouL,” he turns an old neon liquor store sign upside down, lights up only the letters that spell “soul,” and festoons it with fake flowers, shoe tips, and shoelaces. It reads like a roadside memorial, and weighs alcohol as a killer against alcohol as a spirit and sacramental offering. The installation “Happy Smilers: Duty Free Shopping” takes its name from a band Ward’s uncle played in on the tourist circuit, a name that reinforced stereotypes about grinning Jamaicans. Here, it’s emblazoned on a bodega awning strung with bottles of neon-colored tropical sodas. Ward based this piece on a candy shop in the Harlem neighborhood where he lives — a front for a gambling operation. Happy on the outside, high stakes on the inside. He lines the walls with household items wrapped in firehoses, evoking a snail’s shell — carry your home bundled with you. A fire escape with an aloe plant hangs from the ceiling, part Jacob’s ladder, part cage. A trough filled with salt, which Jamaicans say has healing properties, sits beneath. The sound of rain crackling on a tin roof will soothe some and frighten others. Here’s the gamble Ward’s “Happy Smilers” fronts: A place of origin and hope, threat and healing. To find themselves, heroes go into dark, frightening places — places where they’re misunderstood and attacked, places of foreboding and decay. This seems to be what this artist is after, to find himself and the communities where he works. Much of Ward’s art has a rugged, patchwork beauty, like a quilt stitched from the rags of beloved old clothes. “Oriented Right,” however, took my breath away. The artist saw a pattern of holes in the floor of the First African Baptist Church in Savannah, Ga., which had been a stop on the Underground Railroad. If need be, escaping slaves hid beneath the floorboards. Ward re-creates the holes’ kite shape in the upper right of an oak panel covered with copper. Copper nail heads glimmer around the holes. The artist, always intentional about leaving marks of his labor, painted chemicals on the soles of his shoes and shuffled across the surface, oxidizing the copper. He then etched lines radiating from the holes. The Underground Railroad is a chapter of American history that reflects the worst of us, and the best. Ward invites us to see the beauty in the struggle. His smudged surface looks like the surface of the earth; the nail heads could be blossoming flowers, or the sun itself. And those holes? A place to breathe. A place of darkness. A place to be saved.